The Janda Busse Small Size Sewage Treatment System is designed on the basis of the German industry norm "DIN 4261" part 2 and comprises two treatment steps, namely pre-treatment and aeration. In the pre-treatment step, which also serves as waste water storage, biologically degradable coarse material, such as faeces, toilet paper, is dissolved and non-dissolving components are being separated from the waste water by an aerated sieve. The waste water from which the coarse material has been separated is pumped to the aeration section. In this step, the organic matter in the waste water is degraded biologically by micro-organisms and oxygen. In addition to this, the waste water is treated physically by micro-filtration membranes (ultra fine filter with 0.4 µm pore size). These membranes eliminate suspended material, even bacteria and germs, ensuring that only absolutely clear, odourless, hygienically harmless water (filtrate) leaves the system. 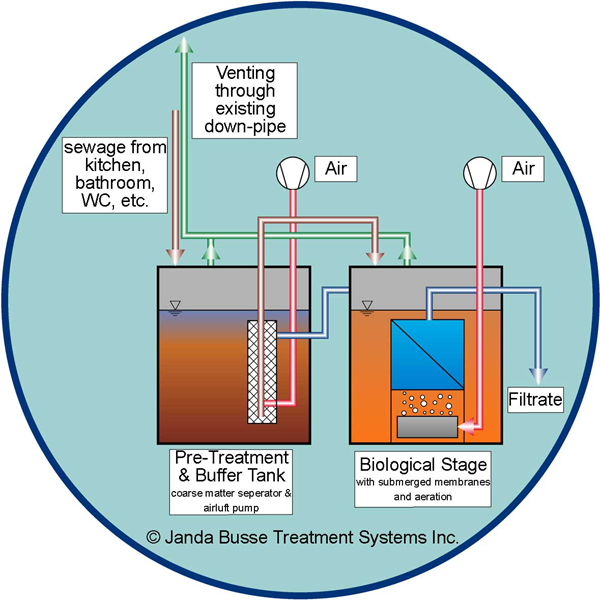 The Janda Busse system was tested and certified by NSF International as to NSF/ANSI Standard 40 Class I. Additionally the requirements of NSF/ANSI Standard 245 were met. In Germany the Janda Busse system was tested by the University of Hannover and the Technical University in Berlin. The effluent from the system is significantly better than the limits set by DIBt Berlin (Z-55.3-60) and the applicable law. Due to the immersed micro-filtration membranes, in combination with a technologically required high concentration of biomass, COD levels in the discharged water can be reduced to under 30 mg/l and the BOD5 value to under 5 mg/l.